I do not like mushrooms so I searched for a green bean casserole recipe that did not use cream of mushroom soup. I found this recipe on Pinterest and it was delicious. I will be making this for all our holiday meals. The recipe can be found here. Spray a 9x13 baking dish or a casserole dish, with cooking spray. Set aside. Melt the butter in a large pot over medium heat. Once the butter is melted, add the flour, salt, sugar, and pepper. Stir with a whisk for 1 minute. Stir constantly. Take the pot off of the heat and add the sour cream, and dried minced onion. Stir together until it is combined. Add the green beans, half of the cheese, and half of the fried onions. Stir together and pour into the prepared baking dish. 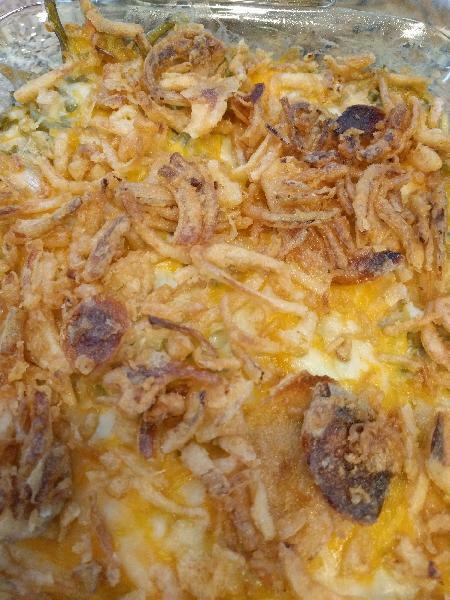 Top with the remaining cheese and sprinkle with the remaining fried onions.